RNN Training has showcased its success stories in its support for the recent International Women in Engineering Day. The annual event was set up by the Women's Engineering Society (WES) to focus on engineering and technical roles for young women, and celebrate the achievements of women engineers. The training provider, which is part of the RNN Group, is committed to encouraging women into the engineering profession and picked out former Rotherham College mature student, Lisa Pogson, as a great advocate for women in engineering. Lisa studied for a HND in Business & Finance and is now joint managing director of Airmaster Air Conditioning based in Swallownest, and president of the Barnsley & Rotherham Chamber of Commerce. Lisa, who has worked in the construction industry for most of her working life, said: "I'm passionate about encouraging more females into STEM roles and studying at Rotherham College really helped advance my career in the field. "Through rich storytelling and highlighting role models young women can relate to, I believe we can help inspire more to pursue a career in engineering." RNN Training also highlighted the success of Ellie Chandler who became the first woman to work in the engineering maintenance team at HMP Moorland. 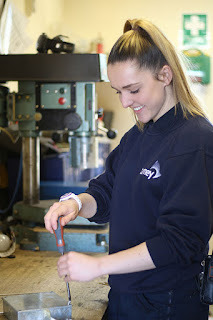 Starting her working life providing operational support at Doncaster Prison, Ellie was looking for the opportunity to progress further when she applied for an Engineering Apprenticeship with AMEY, a company that provides engineering maintenance. Ellie (pictured) explained: "Our role is to make sure that the environment is safe and this could range from small jobs to a "smash up" where a prisoner has gotten angry and broken things. In those situations we'll go to a job immediately and carry out repairs." Ellie also spends time at Rotherham College to support her practical learning, and takes part in a small tutorial group. Offering her advice for other women who are considering a career in engineering, Eliie added: "Go with an open mind, and don't be worried just because it's a male dominated industry. If you think you'd enjoy it, just do it and you'll be absolutely fine." Philip Sayles, deputy principal of the RNN Group, which includes RNN Training, said: "It's the job of training providers, teachers, colleges, universities and parents to work together and educate young people about what's involved in a career in engineering. "It's not solely about maths and physics, but about project management and being creative. It is also vital to solving the problems that the country and world are facing today. "An engineering course at one of our colleges is the perfect start to any young person's engineering career, whether they desire to progress on to a Higher Education course at college or university or go straight out into the industry."